Beistle 57751-21 "21" Glittered Streamer. 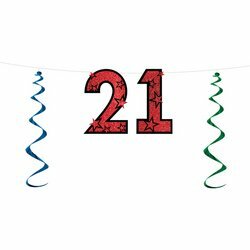 This glittery colorful streamer will make a great decoration to hang up at your 21st birthday! Hang this from the ceiling, over windows or on the door. Beistle 54691 Ice Cream Soda Cutout, 35"